Hey everyone, I am up with a simple thank you card. I started with a watercolor paper, and did sponging using distress inks. Then I ran the panel using the Paper Smooches Super2 die for the house. 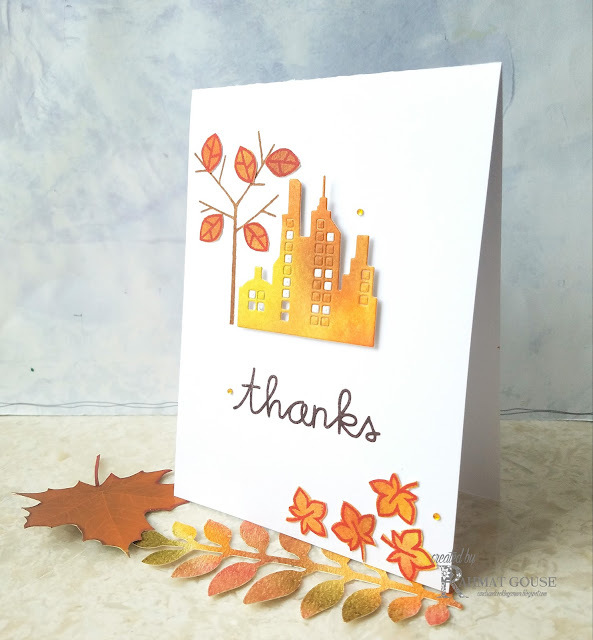 I stamped the leaves from gently seasoned set from PS, and fussy cut to add to the card. The bare tree is also from the same set. I arranged a few leaves on the tree, and a few at the bottom of the card. The sentiment is also from Paper Smooches, a few rhinestones to finish off. Simple and FABULOUS! Love your design! Thanks so much for playing in our ‘Thankful for Nature’ challenge at Dies R Us! Please come back again soon! I think your card is GREAT!! I love the colors and design! Thanks for sharing with us at CYPC! Gorgeous CAS design. Thanks for joining us for the ATG challenge at Polkadoodles Craft Challenge. Stunning card, love the design! Thank you for playing along with us in the DIES R US challenge! Very pretty, clean and sharp! Thanks for joining our Thanksgiving Challenge at Tuesday Throwdown!